2017 is the year of the fire rooster. The solar year starts 3rd / 4th of February 2017 and the Lunar year which denotes Chinese New Year starts on the evening of the 27th of January in 2017. It is a time for food, returning to your birthplace and of course red packets and fire crackers! In 1997 I received my certificate to practice Feng Shui form my Master Henry Liu and my now good friend Melynda Munro. I was called to Feng Shui in an irresistible way. You know those forces in the universe which will not go away! The more you resist the harder they drag at you. Well now, 20 years later I am still in the 'industry'. It has undergone a lot of changes since I entered it. There are a lot more players and there are a lot of fly-by-nights who come up with their own pet theories and interpretations. There are people who are stayers who were here when I started, given that they are older than me (some of them), it is unlikely they will still be here when I am gone, but it is completely unknowable how long my bit of string is - could be they will be here after I am gone too. Don't forget you can still book in for your one-to-one annual flying star follow up by sending me an email or calling me up on 0427 902 220. 8 Australian Politicians - all roosters! Remember you can still book your personalised annual update from now onwards. This is a little preview of the lovely calendar I've prepared for you. This way you can keep track of all the days with their English names clearly marked. You can download it, print it out, or keep it electronically. If you print it on both side, laminate the 6 pages then you can bind it and rest it on a plate 'rack' and leave it on your desk for ease of use. Each of the beginning of the month, the middle of the month and the clashes to the month and the year are marked too. 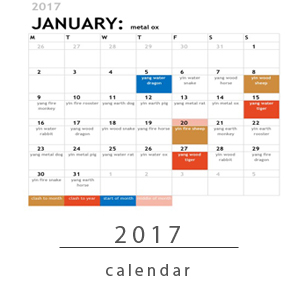 it is the first time I've prepared this calendar and will replace the monthly clashes and benefits as it takes me a very long time to prepare. This is the start of my new adventure - regular podcasts. I am hoping also to move most of my audio recording to iTunes for the future. That is another project however. Oh btw no more video's they take too much storage space on the website and are not that easy to use. The podcast is up but a little rudimentary in quality. Please check in with the webpage as, I will take the time to refine it a little later when I have a moment. I am also going to try streaming the seminar next week! Check the podcast page for details.